Do you have multiple developers at multiple locations? Buy the Enterprise license. Enterprise license holders can use up to 10 connections – either Office Party or Individual – to participate. In addition, you are granted license to share the videos with all developers in your company. Tickets are transferable. If you sell/gift your ticket, please let us know, we are happy to transfer ownership on our end. PHP 7.0 was a leap forward in performance; 7.1 was another step forward, as was 7.2 and 7.3. With nothing more than keeping PHP up-to-date, applications get faster, servers work less and handle more. So why worry about performance if PHP is going to do it for us? Applications grow increasingly more complex every day. The amount of code and markup that has to be served to the frontend is growing almost exponentially. Yes, the backend is getting faster but the needs of the application are growing at the same pace, if not faster. Upgrading PHP these days is just treading water. 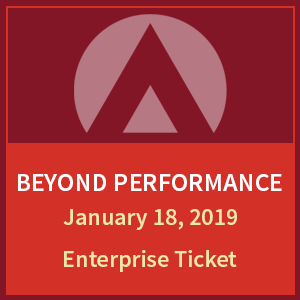 Developers, teams, and companies have to be on the lookout for ways to make their applications perform faster; they have to look “Beyond Performance”. That is the theme of this next Day Camp 4 Developers and that is what our speakers will help you do, look beyond performance. We are countering everything from what makes PHP tick, to multi-threaded, non-blocking programming in PHP. Join us, bring your team, spend a day leaning how you can look “Beyond Performance”. Learn how to take your application to the next level before your competition does.